What is a consultant? A consultant is an expert who is trained to analyze problems and advise a client in order to help the client make the best possible choices. As of May 2015, there were approximately 614,110 management consultants employed in the United States, with management consulting generating over $200 billion in revenue. Consulting firms have experienced an increase in revenue of about 12-18% in recent years. While the range of industry interests within consulting is vast, ranging anywhere from consumer and industrial products to healthcare, public sector, or technology consulting, the three main types of consulting fall into three categories: economic, management/strategy, and IT. For pre-MBA and undergraduate students, consultant compensation has grown by over 20% in recent years, making it a career path you certainly should not ignore. As a first year consultant out of undergrad, a consulting analyst/associate (the two terms are used relatively interchangeably, and is simply a matter of firm preference) can expect to make anywhere between $80-100K a year. 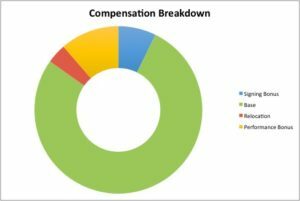 Below you can see the average compensation breakdown. Note, this figure relies on data that takes into account the average salaries of some of the top 16 consulting firms. Though the consulting hours are by no means a cakewalk, with the average consultant working almost 12 hours/day (that number can be flexible depending on the client/project you are working on), according to the data from our site, former analysts rate their consulting experiences relatively favorably. In terms of gender equity, the US Bureau of Labor and Statistics has reported that management and tech consulting services currently employ about 609,000 women, meaning that women represent about 44% of all employees in those areas. While the consulting industry may seem gender balanced, it should be noted that women only make up 10% of consulting partners, meaning that women are much more likely not to hold upper level positions, or choose to leave the field after a few years. One of the greatest things about consulting is the ability pursue a myriad of paths once you’ve worked at a firm for a few years. 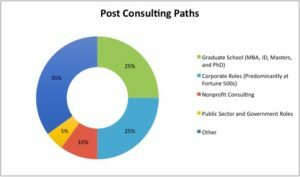 As you can see below, according to a study by Management Consulted a quarter of consulting hires either decide to head back to school to get another degree or go on to obtain corporate roles, predominantly at Fortune 500 companies. Though entering into public service is the least common route, former presidential candidates, Mitt Romney and Bobby Jindal, both began their careers at McKinsey and Bain, respectively. According to Statista, McKinsey leads the pack as the consulting firm with the highest prestige rating, with BCG, Bain, and Deloitte trailing closely behind. One of the unique – and notorious – facets of consulting recruiting is the case interview. Typically consulting hiring consists of two interview types: behavioral and case. The behavior interviews are your standard “get to know you” interviews, but the case interview is where things get slightly more difficult. In a case interview, you’re typically given a market situation, and it’s up to you to solve the problem at hand. 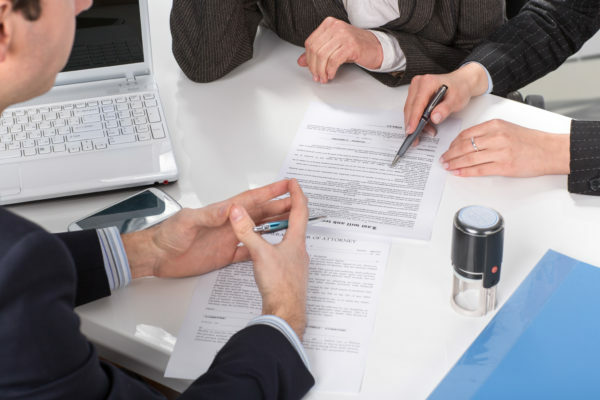 While case interviews may seem daunting at first, with time, practice, and good preparation, soon you’ll be able to analyze any situation like a consulting pro. Almost all large consulting firms, such as Bain and BCG, offer sample case questions that have come up in previous interviews that you can study to get a better sense of what is expected of you. There are also a number of specialized practice books you can use to get you a little more familiarized with case interviews and how best to approach them (I personally own a copy of Case in Point). Finally, be sure to contact your university’s career centers! Most offer special crash courses, or allow you to schedule mock case prep interviews. Polish off those cover letters and update those resumes and maybe you’ll be working in consulting in no time! Check out our company guides on McKinsey, BCG, and Deloitte to help you decide which firm is right for you. Questions, comments, thoughts? We love it. Reach out to us.